KANAZAWA--Down 8-0 in the bottom of the ninth inning and with little hope, the Seiryo High School baseball team still never forgot its motto, "always keep smiling." 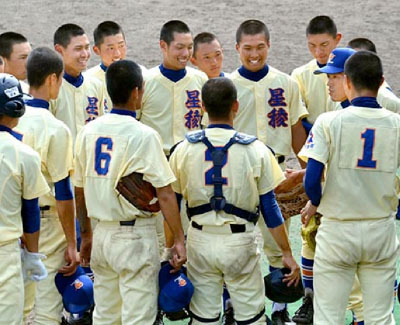 Before his team went up to bat in the prefectural final against Komatsu Otani High School, the winner to qualify for the National High School Baseball Championship, manager Kazunari Hayashi said, "Let's bat around the order." His players broke out into big smiles, but that may have been because they thought he was joking. After all, the team had managed only two hits through eight innings off Komatsu Otani starter Amon Yamashita. Hayashi said later he was inspired by pitcher Daiki Iwashita, who came off the mound with a smile on his face after striking out the side in the top of the 9th. Iwashita had returned to the mound after being pulled in the fourth and moved to right field. The team chose the smile slogan because it helped them think positively and play their normal brand of baseball. Still, the results went beyond anyone's wildest dreams. Team captain Kenya Muranaka led off the bottom of the 9th with a walk. Pinch-hitter Haruki Imamura smacked a triple, and that opened the floodgates. With seven additional hits, a walk and wild pitch, among other developments, a total of 13 Seiryo batters came to the plate. In all, the team scored nine runs for a dramatic 9-8 come-from-behind win and a berth in the prestigious summer tournament at Koshien Stadium. Even Hayashi seemed surprised by the comeback, but he said, "This was a game where we were able to demonstrate Seiryo's tradition of bearing with difficulties to win." Yamashita, who had to leave in the ninth inning when he developed cramps in his left leg, said "I think this is what baseball is all about." Seiryo is a powerhouse in Ishikawa prefectural baseball, having qualified for the summer tournament 16 times in the past. Former New York Yankees and Yomiuri Giants slugger Hideki Matsui is an alumnus.